I got my DVD-RV20 back in year 2000. And now 16 years later it still works, just like the day i got it. Never had any problems at all, never even cleaned it inside. The only negative things is that it don´t play cd-r´s. But everything else just goes perfecty. This i the only dvd player i ever had, havent owned any other dvd machines other than this one. And won´t even think about replacing it, before it stops working. It´s stabile, reliable, and still up to date, with most modern sound requirements. 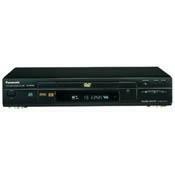 I´m sure i´ll never have a better dvd player then the panasonic dvd-rv20. it is broken...rude lady from customer service stated rudely..."video and audio are differnt things" -- no! really! Don't buy from Panasonic! This was a nice unit until the "no disc" screen becomes a constant reminder of disposable products in a consumer based society! I now will buy the cheapest i can find...what is the point anyway? Great picture and audio, when it worked. Add me to the list of dissatisfied customers. Though I got a bit more use out of it than some of the previous reviewers, at or about 10 months after purchase it has completely stopped funtioning. Pixelates and freezes anywhere from 1 - 15 mins into any disk, and that is when you can get it to read at all. Good while it works. Great if you just like watch the words NO DISK on its little screen when it craps out on you 4 months later. Broken after 4 months with $75 labor to repair the Laser pick-up assembly. Plans to use it for a door stop. This is for the RV-26. Sometimes experiences in life make you wish you could picket electronic stores warning naive customers about crappy products. Well the Panasonic DVD-RV26 makes me want to. DON''T BUY PANASONIC PRODUCTS BECAUSE EVEN THOUGH THEY ARE EXPENSIVE PRODUCTS, THEY DON''T LAST! Well maybe for a few months. Let me give advice to those who are having problems and debating taking theirs back. When the movie you are watching starts pixelating and hangs, RUN -don''t walk to return it. If you think they will be kind and fix it under warranty a day after it expires, forget it. Get out your wallet. This is the only time that I would recommend one of those annoying extended warranty plans. Trust me - you''ll need it! *Congradularions Panasonic, you have started to produce really crappy stuff, ruining your reputation. Their new style of phones stink too. Ahhh... the good ol''days. I hope their CEO can afford that new swimming pool because they are not spending money on good components! It's a very good DVD player. It will not disappoint you! None, except for it can't play CD-Rs. This DVD player is great. I have not had any problems with it. The "Virtual Surround Sound" feature works well, too. The only thing that dissapointed me was that I couldn't play CD-Rs in it. But otherwise I would definately recommend it. This review is for the DVD-RV26 new in 2001. I was looking for a new DVD player that would play CD-R discs that I recorded with MP3 files. One disc will hold about 170 songs and play up to 11 hours of music. To play MP3 files the player must have a decoder in it. I was pleasently supprised by the excellant picture quality using the S-video output as compared with my previous Toshiba DVD. This unit packs a lot in for the money. It has Dolby Digital and dts decoders, component and S-video outputs, high speed (up to 100x) variable search. Perfect freeze frame, and plays MP3 songs and audio on CD-R and CD-RW discs. It has other features and on screen display of settings. The RV26 does not show MP3 song titles which can be a drawback for some but will show the song number at least to 177. I don't care since I can play them on my computer if I want to be picky or just skip a song with the remote. There are other DVD players now that will play MP3s but some won't have the quality of this Panasonic so I think it is worth a little extra. You won't be disappointed. Picture quality is awesome. Can't beat the value for the price! Wow. This player produces great picture quality, has a dedicated Sub output, and best of all for the family - the remote is easy to work and intuitive. If you want a great player which won't break the bank, get this one. If you want a better player, you'll have to get a progressive scan player. Doesn't work. Terrible customer service. I had very serious problems with this DVD player. After 5 months the player began to overheat about 15-20 minutes into any DVD. The screen would pixilate and freeze. I called panasonic consumer services and they refused to repair or replace the unit.